A specific feature of the Western Calligraphy is said to be the illuminating of the first letter of each chapter of a book. The idea of illumination of text here, is the integration of the text and ornamentation on the page -patterns, borders, illustrations etc.- so that the text is in a way is enlightened with the addition materials. Yet there’s a more strict deciphering of the concept of illuminated manuscript, that is that the illuminated script only stands for books with either golden or silver ornate. As did the eastern and Asian calligraphy, western calligraphic script too had its strict codes as each character of the western calligraphic type had an accurate stroke order. As it’s regarded as a form of religious art, such rules and shapes seems reasonable. 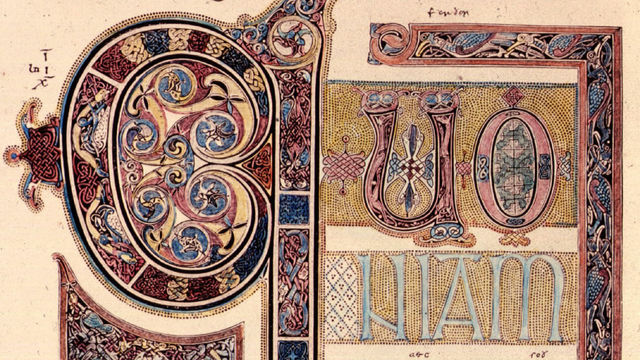 As seen above and below, the Lindisfarne Gospel book is a highly ornamented one, in which each gospel consists of 15 pages of such written and drawn decorative elements, and used for ceremonial purpose. The pattern designs are pretty sophisticated, fuzed with bird, snake and several other animal illustrations and few decorated initials. The depictions are usually geometrical or stylized imperfect animals. 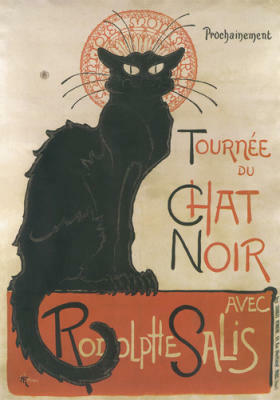 The decorations reminded me pretty much of a poster for a cabaret theater in France which i’m deeply devoted to: Le Chat Noir‘s, in means of both its typographical elements -yet there’s no usage of calligraphic writing here- and also in color aesthetics.